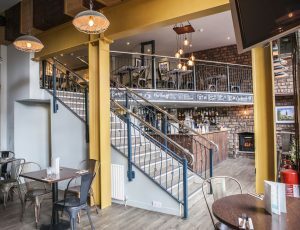 Located in the heart of the West End of Glasgow, Bank Street Bar Kitchen is a lively bar offering a fantastic range of spirits, craft beers and wines accompanied by some awesome food including our stone baked pizzas, gourmet burgers and delicious curries as well as other adventurous, tasty dishes. We at Bank St strive to offer our customers with the best value for money in the area matched with a lively vibe and friendly service. Just a stone’s throw from The University of Glasgow, Great Western Road and Kelvingrove park, it’s a perfect place to meet friends for a pint (or two…), take the family for dinner or enjoy barista quality coffee. Open from 10 am till 1am 7 days a week provides an excellent place for brunch or a late night drink. Catering for everyone, it’s about time you join us! Find contact details and social media links below.